As we age, the small cells in our ears that detect sounds can be damaged from disease, injury, medications, or simple age deterioration. The more the number of these cells are reduced, the more difficult hearing becomes. A hearing aid can amplify sound to activate the surviving cells to improve hearing. However, there are situations in which these cells are too damaged for a hearing aid to work. ListenClear understands hearing loss is a unique experience for everyone and everyone has a unique lifestyle. Its hearing aids are designed to fit your specific needs. Browse their selection online and take advantage of their 45-day free trial. ListenClear is a hearing aid company based out of Savannah, Georgia that sells their brand of hearing aids through a direct to consumer sales model, which amounts to around 50 to 70 percent savings by selling directly to doctors, audiologists and stores. By cutting out the middleman and using online sales, ListenClear makes hearing aids affordable for most people. ListenClear offers many benefits, like a 45-day risk-free trial, patented high-definition technology in their hearing aids, warranties and cleaning service, payment plans and a discount for using your credit card when paying online. ListenClear, in operation since 2011, sells directly to customers to help to reduce the cost of hearing aids. The company sells the ListenClear line of over the ear and in-ear hearing aids along with warranty and repair services. With the 45-day free trial on all hearing aid models, you can get hands-on experience before committing to the final purchase, taking much of the fear out of buying online. ListenClear also offers support over the telephone to assist customers with making minor adjustments to their hearing aids rather than requiring shipping them back. ListenClear offers three hearing aid models. You can order a set or a single hearing aid for your left or right ear. ListenClear’s two over-the-ear hearing aids are registered with the FDA and come with a selection of tips, which fit into your ear to hold the device in place comfortably. All three hearing aid models come with a warranty, discussed below. ListenClear sells two mini behind-the-ear hearing aids which are nearly invisible when worn. The speaker fits in the ear with the remaining hardware and battery stowed away in a small compartment worn behind the ear with a transparent wire connecting the two pieces. You have a choice of beige, brown or silver for the compartment. The last model is designed to be completely inside the ear and comes in black. All hearing aids are interest free. The Pro is the most affordable hearing digital aid ListenClear sells. This hearing aid is advertised as lightweight and customizable with all-day comfort right out of the box. No fitting appointment is required, and the quick start guide will help you with determining if any accessories are necessary to enhance wearability. You control volume by tapping a small button on the hearing aid. The ListenClear Pro hearing aid is appropriate for mild to moderately severe hearing loss and comes with a size eight hi-fi Easy-Click tip. Also included are three additional sizes of Easy-Click tips, a two month supply of batteries, a case, user manual and quick start guide, accessory guide and warranty. This model comes with a small wireless remote to change volume and use the multiple program settings quickly and easily without removing the earpiece. Try ListenClear Elite if you have mild to severe hearing loss. Similar to the Pro model, the Elite is very small, lightweight and is designed for use right out of the box. The hearing aid comes with the wireless remote, two packs of four batteries, a hi-fi tip installed on the unit, three extra tips of varying sizes along with a carrying case, user manual, quick start guide and the original standard warranty. ListenClear’s ITE is designed to be almost entirely unnoticeable in the ear because it rests right in the ear. This hearing aid works best for mild to moderate hearing loss and comes in black to blend with the shadows in the ear. You can adjust volume by tapping on the unit. The ITE hearing aid does not use tips and comes with eight batteries, a carrying case, the user manual and quick start guide, an accessory guide, and the standard ListenClear warranty. As explained by the National Institute on Deafness and Other Communication Disorders, hearing aids consist of three parts, a microphone, an amplifier, and a speaker. The microphone is a receiver, taking in sounds, the amplifier makes the sounds louder, and the speaker transmits the sounds into the ear. ListenClear hearing aids digitally amplify sound to frequencies up to 14kHz. The devices use 111 high definition channels to automatically adjust to the environment and reduce the need for making volume adjustments manually. One model includes a wireless remote control to make adjustments, and another hearing aid features discreet adjustments by tapping the unit. ListenClear offers a 45 day trial of new hearing aids. You give payment information at the time you order the trial hearing aids, but there is no charge until after the 45 days is up, unless the hearing aids are lost, damaged, or you decide to keep them. Try the hearing aids in a wide variety of situations to get an accurate feel for how the units function. You should test the hearing aids anywhere you typically spend time to see how much your hearing improves. This test includes using the hearing aids while on the phone, although ListenClear advises there may be occasional minor feedback while using the phone. The frequency of this annoyance varies with the type of phone you use. It is helpful to use a phone designed for use with hearing aids to avoid feedback. ListenClear believes that you need to use their hearing aids for over 21 days during the free trial so you can get accustomed to using them. Just like your eyes take time to adjust to a new pair of glasses, your ears need time to adjust to new hearing aids. To return hearing aids within the free trial period, call customer service, and they will send a postage paid return shipping label and refund the purchase price of the hearing aids. ListenClear offers two different warranty options. All of their hearing aids come with the original one-year warranty and the warranty period starts on the date of purchase. This warranty covers defects in workmanship and materials with the unit but does not include physical or water damage. The Universal warranty covers loss or damage to the hearing aid for any reason, such as water damage, lost, stolen, or broken. This warranty costs $5 a month per hearing aid unit and requires payment of a $75 deductible for each warranty claim. ListenClear runs promotions from time to time, adding the Universal warranty at no cost. ListenClear also has a clean and check service available outside of warranty service. This service covers an evaluation of the hearing aid unit and cleaning for a $50 fee. Repairs cost a $150 flat rate. ListenClear monthly battery shipment program, no charge to qualifying customers. ListenClear bulk battery sales program, roughly the same cost as popular discount stores. Buy your own locally at any drug or big box discount store. Look for 312 brown-tab batteries for ListenClear over-the-ear hearing aids and size 10 batteries for the ITE model. ListenClear has many positive online reviews about the quality of the hearing aids. The majority of the complaints we found are from customers wanting to return the product outside of the 45-day trial and issues with customers feeling some sales pressure to buy the product if they call to return it within the 45-day window. Hearing aids are vital to many as aging changes hearing capacity, yet Medicare does not cover the cost. However, if you have Medicare supplement insurance, find out if your plan includes hearing aids and how to submit a claim. Does ListenClear offer payment plans? Yes, ListenClear offers a 24-month installment payment option when paid monthly on a credit card or through automatic withdrawal from a checking or savings account. For example, the monthly payment for one ListenClear Pro unit is $50 per month for a total of $1,200 paid over the 24-month term. Additional payment options may be available based on your financial situation. Can I get ListenClear hearing aids through my doctor? No, ListenClear is a direct-to-customer seller and does not sell through doctor’s offices. ListenClear does have discount pricing available with an up-front credit card payment or withdrawal from a checking account. You have to call customer service about this because many factors can affect your eligibility for discounts. I am not on Medicare. Will my insurance cover the hearing aids cost? Most medical plans do not cover hearing aids or offer only limited coverage, although a few cover hearing aids in limited amounts such as $1,000. In the case of children, 20 states mandate that health insurance plans cover hearing aids for children. ListenClear does not bill insurance companies so you will need to find out if your insurance offers coverage and how to submit the expense documentation yourself. ListenClear offers affordable hearing aids with a variety of programming and features and can custom program hearing aids for you if you provide an audiogram. You can try or buy ListenClear hearing aids without seeing a doctor, however. 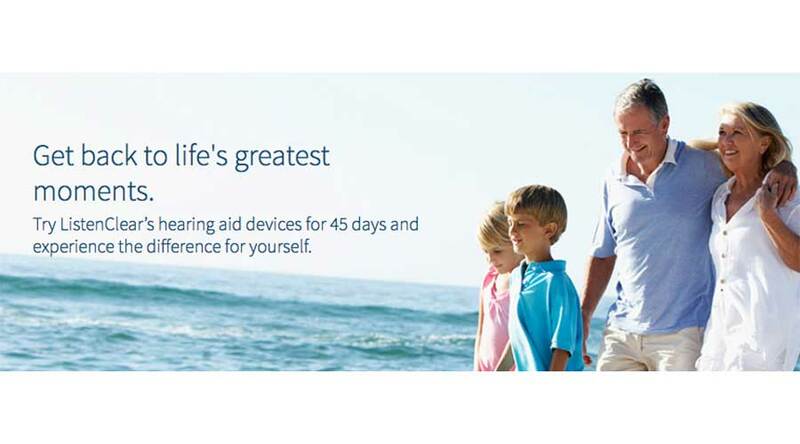 The lengthy 45-day risk-free trial offers some peace of mind that if the hearing aids don’t work out, you can return them without losing a penny. Just be sure to follow the free trial terms. I have a similar review as the first person. The hearing aids were a little short for my ears and kept popping out of my ears. Then due to a death in the family, I did not keep trying. I had asked upfront for a return envelope, but never received one. I kept asking. Soon my time was up. I sent them back on my own. They still call and want me to pay! They still try to negotiate a price.. Harassment! Company very poor customer Service. Received product and never used product based on instructions from our doctor that this product would not help my wife's hearing. Listen Clear still charged me the first payment fee even after I called them 3 times and told them of my wife's pending exam and I was told to hold onto the product until after the exam The product was returned and they still charged the first payment. Watch what they say. I'm soon to be 70 years old with moderate hearing loss. I particularly wanted these so that I could hear what our Sunday School youth were saying to me without asking them to repeat themselves. That problem has been solved along with so many other benefits I receive now that I can hear better. When you first put them on you immediately notice a difference. It's the days following that you really begin to experiment with what is comfortable and what works best. I can understand now why they give you a 45 day trial. If you're serious about purchasing hearing aids you'll appreciate the time it takes to get questions answered. I had many questions and tried different size tips (that were sent to me free of charge). I also sent my hearing aids back to have them adjusted according to my most recent hearing test (last 6 months). When I got them back I noticed the difference. The gentleman who worked with me was quick to respond to my questions/concerns. And he assured me that I can contact him with future issues/concerns. ListenClear didn't have to try and sell me on the benefits of their hearing aids... the hearing aids sell themselves. What I did need however was someone willing to work with me, answer my many questions/concerns and encourage me to pursue the most comfortable fit for my listening pleasure. Bottom line... I am very happy with my ListenClear hearing aids and the people who have worked with me every step of the way. The cost of my hearing aids are 50/55% cheaper than what I had been quoted from other hearing aid specialists and I am on a 24 month interest-free payment plan.